Research In Motion today announced a new series of Bold handsets, the 9900 and 9930, which marry a traditional BlackBerry QWERTY keyboard with a touch screen. The new Bolds are the first BlackBerries to include near-field communications (NFC) for mobile payments. They also include a magnetometer, which supports augmented reality applications. Both devices feature a 2.8-inch capacitive touch display with 640 x 480 pixels; 1.2GHz processor with 768MB of memory; 8GB of on-board memory and support for microSD cards; 5 megapixel camera with 720p HD video capture; and accelerometer and proximity sensor. On the radio side, it comes in two configurations, one quad-band GSM/EDGE with tri-band HSPA+, and one dual-mode CDMA EVDO Rev. A, quad-band GSM/EDGE, and dual-band HSPA+. Both include Bluetooth 2.1+EDR and 802.11b/g/n Wi-Fi. Both devices will be available later this summer. Price points weren't announced. During its recent shareholder meeting, Research In Motion's executives said that the company is on track to release seven new smartphones in what it says will be its biggest product launch ever. 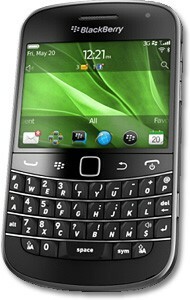 RIM originally planned to release the Bold Touch 9900/9930 this summer. Sprint today announced that it will sell variants of the BlackBerry Bold Touch 9930 and the BlackBerry Torch 9850 later this fall. Pricing and the exact availability were not disclosed. What I was Waiting For? I love the specs, I really do. I just hate looking at the phone. If I were to purchase this phone, what "ahh" factor would I get? How and what BB device can I purchase thats going to make me feel/look superior to others? If I buy this phone, the old bb users are not going to feel left behind when looking at my phone and I won't feel like I'm out doing them by looking at their phone and looking at mines, because they all "Look" the same!!! Seriously? What do you want? Matching purse and pumps to go along with it? "How and what BB device can I purchase thats going to make me feel/look superior to others?" WHAT?!! no Android APPs or Flash Support on BB OS 7. Yeah, I'm done! But you're still convinced that BlackBerry OS is a viable alternative to iOS and Android. Guess what: you are incapable of becoming a serious competitor to other manufacturers without scrapping BB OS. Adopt Android and reap the profits. I remember when I suggested that to my BB rep a few months ago. His response was that BB6 was Android. For a millisecond, I thought he literally meant that the new OS was a hybrid BB/Android OS or something awesomely cool like that. Sadly, he didn't.